This charger is not compatible with Switzerland/Brazil/South Africa 3-prong outlets. This unit does not support voltage transformation. With a size of only 3.8 x 2.5in our travel adapter is the smallest in the category. It will fit in any traveling back, whether it's your suitcase, hand bag, back pack or even a pouch. It also packs a highest capacity of 2000 Watts, which means you can use it with almost any electronic device you can imagine - your mobile phones, laptop, camera, toothbrush, hair dryer, curling iron, iron and many more. It comes with 5 international wall plugs and is perfect for traveling. 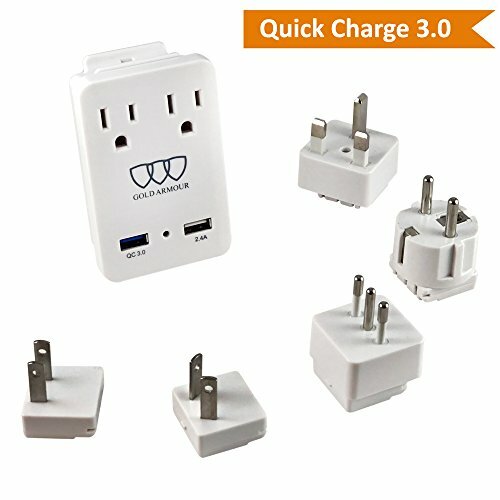 5 plug adapters included support outlets in North America, United Kingdom, Europe, Italy, Chile, Australia, Japan, China etc., covering more than 150 countries over the world.